2011 Aprilia Dorsoduro 1200 ABS. Picture credits - Aprilia. Submit more pictures. A totally personalisable riding experience with triple-map ride by wire. 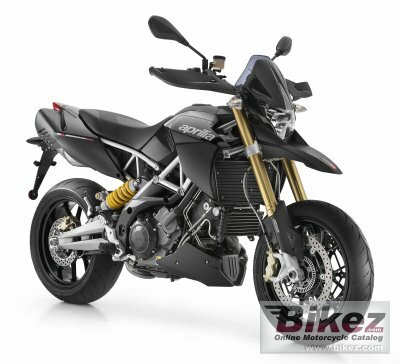 Dorsoduro 1200 is also available with abs and atc-aprilia traction control. Driveline: Primary drive: Straight cut gears, drive ratio: 40/69. Final drive: Chain. Drive ratio: 16/40. Exhaust system: 100% stainless steel 2-into-2 exhaust system with dual catalytic converters and oxygen sensor. Front suspension: Sachs upside-down front fork with fully adjustable compression and rebound damping and spring preload. Wheel travel 160 mm. Ask questions Join the 11 Aprilia Dorsoduro 1200 ABS discussion group or the general Aprilia discussion group. Bikez has discussion forums for every bike. View comments, questions and answers at the 2011 Aprilia Dorsoduro 1200 ABS discussion group. You can sign up for e-mail notifications when other riders answer you. If you have extensive experience with the MC, please send us a review. If you consider buying this bike, you should view the list of related motorbikes Look at photos. Compare technical specs. And check out the rating of the bike's engine performance, reliability, repair costs, etc. You can compare the rating with other bikes.